ICON’s silent art auction features works by local and regional artists like Betsy Huffsmith (above). The ICON Gallery biannual silent art auction begins the evening of the Fairfield First Fridays “Gallery Hop,” Friday, November 2, featuring over 100 works of art by more than 50 artists from Fairfield and beyond. This is ICON’s main fundraiser, essential to the continuing existence of the flagship gallery of the Fairfield art scene. Come out, support ICON, and acquire a beautiful work of art! Everyone who enjoys the arts in Fairfield knows the many ways in which Bill Teeple and ICON Gallery enrich the community—with exhibitions, lectures, slide shows, workshops, museum tours, and more. ICON is 100 percent community supported, and artists join in supporting the gallery by donating their work. The pieces up for auction this month include works by John Preston, Bill Teeple, Robert Hoerlein, Michael Cain, David Fleming, Madeline DeJoly, David Rose, Lexi Janizec, Cris Soth, Joanie McGinnis, Bill Munson, Tony Ellis, Betsy Dockhorn, Stephen Whittle, Cindy Ballou, Care Connet, Gyan Shrosbree, Jim Shrosbree, Kathleen Deyo, Kathleen Edwards Hazelett, Ayala, Wendy Stegall, Gin Lammert, Susan Marcus, Janette Corley, John Evans, Nancy Swisher, Jessica Kirby, and more. The auction also features art from the estate of Don Corley, including original watercolors by Wendell Moore and Betsy Huffsmith, and limited-edition giclée’s by Gene Ronka and Terry Redlin. Bidding begins Friday, November 2, 6:30–10 p.m. and continues throughout the month of November. The final bidding party is on Saturday, December 1. Icon Gallery is located at 58 N. Main Street in Fairfield. Icon-Art.org. While you’re on the square for the “Gallery Hop,” make the rounds to the many other participating stores and galleries—there’s a lot going on this Friday night! Meet Shetland sheep from the local Prairie Farms Woolery on art walk night. And from 7–9 p.m., Diane Frank will be in Bill Teeple’s office at ICON Gallery with both of her new books, Canon for Bears and Ponderosa Pines and Letters from a Sacred Mountain Place: A Journey Through the Nepal Himalayas. Get your copies signed by the author. Also, enjoy a lecture on the “Life and Times of Mozart” at Revelations Café, at 7 p.m., in anticipation of the Everybody Sings community chorus concert at the FACC on Sunday, November 4, 7:30 p.m. 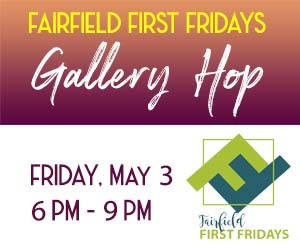 The list of special events and exhibition openings goes on and on—this Friday will be a great night to explore downtown Fairfield!